Malaysia fastly emerges as one of the world's top medical tourism destinations. 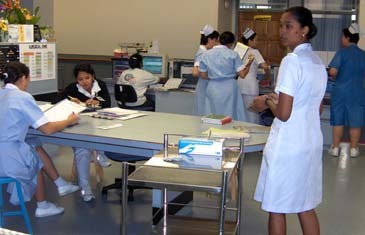 The file photo shows the Malaysian nurses in the hospital. Malaysia is among the world's top 5 medical tourism destinations which present the most attractive opportunities for medical tourists and foreign investors alike, according to Nuwire Investors, an online source for news related to real estate investment and other investment opportunities. These markets were selected based on quality and affordability of medical care as well as receptiveness to foreign investment. Based on these criteria, Malaysia was ranked third. According to Nuwire Investors, Malaysia's medical tourism industry has seen staggering growth over recent years. The number of foreigners seeking healthcare services in Malaysia has grown from 75,210 patients in 2001 to 296,687 patients in 2006. The large volume of patients in 2006 brought approximately US59 million or RM203.66 million in revenue. The Association of Private Hospitals Malaysia has projected that the number of foreigners seeking medical treatment in Malaysia will continue to grow at a rate of 30 percent a year until 2010. Malaysia offers a wide array of medical services and procedures including dental, cosmetic and cardiac surgeries at significantly lower costs compared to the United States. Nuwire Investors also stated that foreign medical tourists and investors are attracted to Malaysia's favourable exchange rate, political and economic stability and high rate of literacy. According to statistics quoted on Hospitals-Malaysia.org, the country also offers a comprehensive network of hospitals and clinics, with 88.5 percent of the population living within three miles of a public health clinic or private practitioner. Under Malaysia's current health tourism promotion drive, 35 private hospitals in the country have been identified to promote Malaysia as a health tourist destination. In addition, Malaysia's real estate market offers the potential for significant returns due to the country's impressive infrastructure, luxurious new real estate projects, easy living, affordable prices and especially major new government directives aimed at transforming Malaysia into a real estate hub. Malaysia also offers some of the best investment opportunities available in the worldwide property market. Nuwire Investors is an online source for news related to real estate investment and other investment opportunities. Through their research and analysis, they provide quality information and monitor trends in alternative investment.